If you’re reading this, there’s a good possibility you made a New Year’s resolution to stop drinking or abusing drugs. For many newly sober people, the thought of giving up that drug of choice can initially cause worry and anxiety. Some think they’ll become boring, others think their social lives will be rendered non-existent. In truth, as tons of people in recovery have already discovered, these fears simply aren’t valid. In fact, you’ll find that being clean and sober is far from a social death sentence. There are tons of fun activities you can take part in – both alone and with friends – that don’t involve a single drug or drop of booze. There are plenty of healthy activities you can take up no matter the season or type of weather. With several more weeks of winter to go, here’s a look at seven sober activities that are sure to keep you busy and fulfilled. If there are shows you’ve been meaning to catch up on or just start watching, winter months are the perfect time to do this. It’s also an extremely affordable means of entertainment. If staying still for an entire afternoon is difficult for you, then take advantage of winter-specific sports or activities. Go ice skating with friends or sledding down a hill on snowy days. Take up snowboarding or purchase yourself a skiing lesson at the local slopes. Even taking a brisk walk or bike ride with the cold air hitting your cheeks can feel especially invigorating. Being in social environments that tempt your sobriety can be challenging, so one of the best solutions is to create your own environment. Throw a potluck dinner with friends and invite them all to bring a dish. Or, if you’re a master in the kitchen, put an elegant dinner together for all your friends. Why not pick a country or ethnic food and create a whole menu based on those local dishes? Your lack of hangovers and non-boozy lifestyle may also give you the chance to try things that have been on your bucket list for a long time. Whether it’s taking a pottery class or seeing a Broadway play, get around to trying the things that alcoholism or addiction forced you to put off for months or even years. 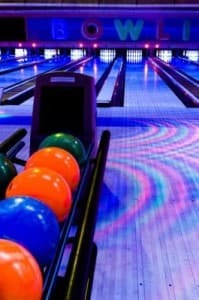 Not only is bowling a fun and inexpensive activity, it’s also an extremely social event that requires minimal skill. Round up a group of friends and get out for a fun night at the lanes. Who cares if everyone throws gutter ball after gutter ball? At least you can laugh with one another and enjoy it! Now that you’re not drinking or buying drugs, your wallet is likely feeling a little heavier than before. Take some of the money sobriety is saving you and treat yourself to a nice meal at your favorite restaurant. You definitely deserve it! You may notice that your clothes are feeling a little looser now that you’re not drinking or using drugs. Use what would have been spent on your addiction to indulge in a few new items for your wardrobe. After all, looking sharp is one of the easiest ways to make you feel like a million bucks. Learn more about extended recovery programs in your area.